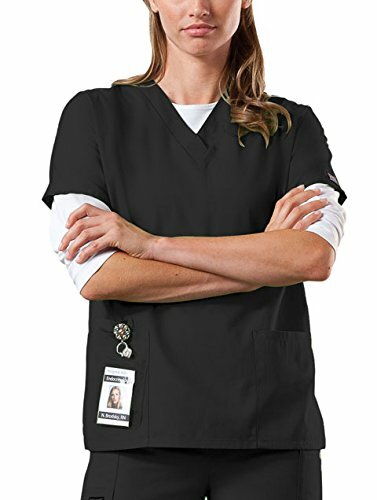 We like the relatively thick, hard-wearing fabric used in Cherokee scrubs, as well as the smart fit. Lots of different colours are available, from bright colours like red and pink through to a very smart navy blue. Most regulation uniform colours are catered for including blue, green, grey and purple. There are two large pockets, as well as a smaller pocket ideal for pens or tongue depressors (because it's IMPOSSIBLE to find a tongue depressor when you need one). Sizes run from UK ladies' size 6 to 28, men's 38 to 54 inch chest. We've always found Cherokee scrubs to be good value for money - although prices do vary. Click through to Amazon to check the latest offers. For ladies - these scrubs are unisex. If you like a loose, casual fit, these are great. If you'd like something more fitted, it might be worth trying a scrub top designed specifically for ladies. Let’s face it, hospital scrubs aren’t the best. You end up with XXXL trousers and an XS top. Possibly it’s the other way round: you end up taping a large scrubs top so that you don’t flash the whole of accident and emergency. And then there’s that feeling when you’re left with the ragged, dubiously-stained scrubs from the bottom of the pile. There is another way. Buy your own scrubs. Sure, you miss out on free hospital laundry. But isn’t it worth it to look smart, to have hole-less pockets and unstained scrubs? We’ve reviewed one of the most popular brands, Cherokee, to get you started.